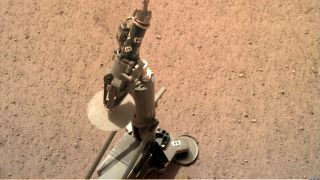 The InSight lander's heat probe, as deployed on the surface of Mars and photographed on Feb. 12, 2019. NASA's InSight Mars lander has successfully deployed its final instrument, a heat probe nicknamed the "mole" for its plan to burrow into the Martian regolith. The instrument will soon begin to drill itself below the surface of Mars, sending out occasional pulses of heat to measure how temperature changes within the interior of the Red Planet. The data it produces will help scientists understand the thermal properties of Martian rock. InSight has already deployed an ultrasensitive seismometer, about 3 feet (1 meter) away from the heat probe. That instrument will track seismic waves echoing through the planet's interior, including the waves produced by the heat probe hammering itself down. All told, scientists are hoping the mole makes it about 16 feet (5 m) down into the regolith. If it can successfully reach that depth, it will explore not just rock that's warmed and cooled by the sun, but also rock that is influenced only by the interior of the planet. During system tests on Earth, scientists proved the mole could work around small rocks, but there's still a chance that a large boulder could block the instrument's path, cutting short the data it can gather. If nothing blocks the probe, its complete journey should take about two months, scientists previously said.